Strikers Edge does have a single player that lets you play through a text-based story as one of the game’s eight characters. The story is simple, but it provides a framework for the battles and some depth to the characters as well. The dialogue is different for each character, so it’s worth playing through the story as each of them to get a little more insight into the game’s world. The game truly shines when you’re playing multiplayer either online or locally. Despite the inclusion of cross-play with PC, you may still have trouble finding matches online. That being said, you can do local battles with up to four players which works very well. So, once you’re in the game, how does it all work? Strikers Edge provides a simple concept and equally simple controls. Anyone can jump in and understand what’s going on. The arenas are divided down the middle, with players on either side. 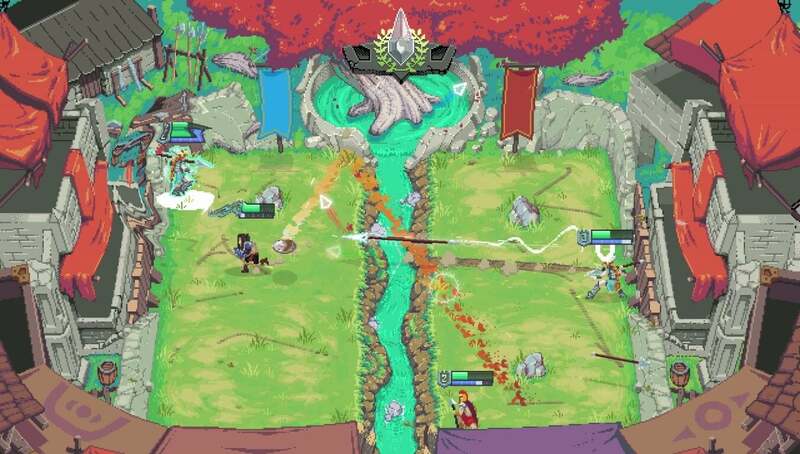 Using the left stick to move and the right stick to aim, you will hurl projectiles across the gulf in the center of the map and try to hit the other player or players. Small pieces of cover are present, depending on the map, but otherwise, you need to stay on the move and utilize your dodge roll. A stamina meter sits beneath your health to keep you from spamming attacks or constantly dodging, so you’ll need to keep an eye on it to avoid leaving yourself open. Some of the maps have hazards that add to the strategy, but the crux of your approach to combat will rely heavily on the special ability of your chosen character. One character, for example, can throw a spear that leaves behind a trail that can be ignited. There’s a nice selection of characters, but there are only a handful of maps to choose from. The amount of content is a little thin, but the gameplay is responsive and the core loop is fun for quick matches. If anything, Strikers Edge is a game that you can boot up when you need to settle and argument or throw some competition into your next get together. 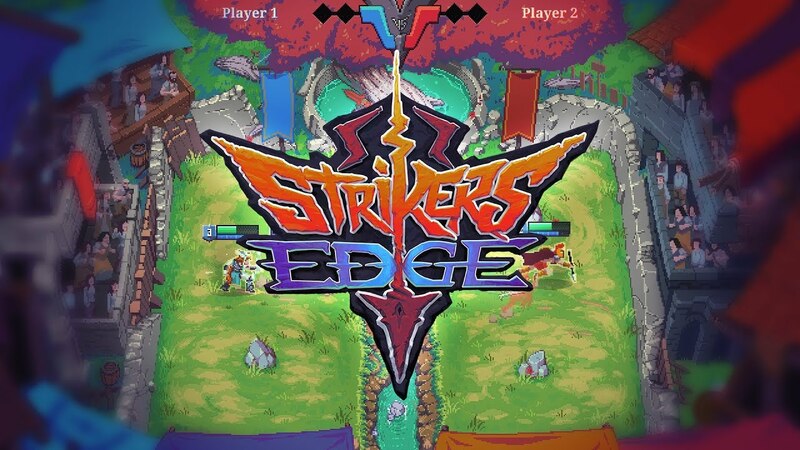 Strikers Edge employs a retro style and a stylish presentation. This lends each of the characters a visual flare, even if they mechanically are very similar. The game runs smoothly and controls are mostly responsive. I will say that the aiming can feel a little loose at times, but I enjoyed the other aspects of the presentation. A fun and upbeat soundtrack rounds out the experience as simple, but polished. In the end Strikers Edge offers a fast-paced fighting game experience that works well in multiplayer. Even with a commendable single player experience, Strikers Edge feels like it was meant for local brawls between 2 or 4 players, and that’s how I recommend you play it as well.